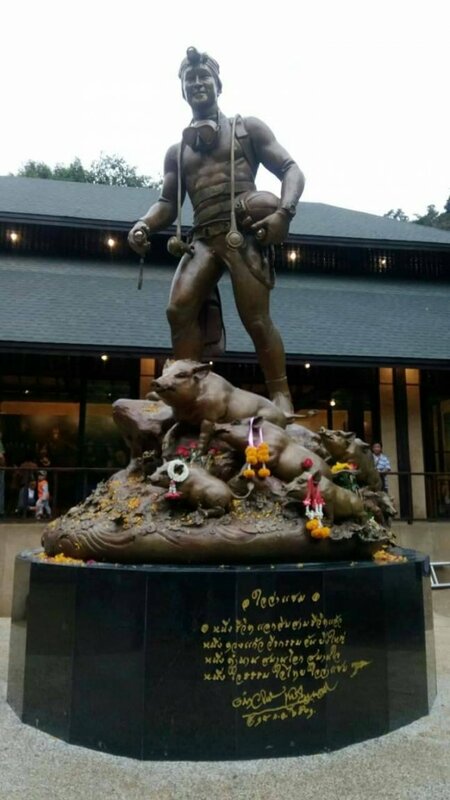 A large painting depicting “The Heroes” of this past summer’s dramatic cave rescue in Chiang Rai has been installed at a memorial pavilion in front of the cave. The 14-by-three-metre canvas was moved from Wat Rong Khun on Wednesday morning, along with another two paintings of the smaller size (each is 4mx3m) under the title “Nang Non”- one was created by National Artist Chalermchai Kositpipat and the other created by various northern artists. Somluk Pantiboon, the artist who led the team that built the teak pavilion commemorating the rescue of the 13 members of the Wild Boars football club from flooded Tham Luang Cave in Chiang Rai’s Mae Sai district in June and July, said the facility was 95 per cent complete. He credited the fast pace of construction to the dedication of those involved, adding that such a project would normally take 18 months rather than four. Somluk said setting the pillars revealed a fine, soft soil rendered golden in colour due to its high iron oxide content. They mixed it with the concrete used for parts of the structure. “The soil is yellow, just like the mud that oozed out of the cave during the rescue mission,” he said. Those parts of the pavilion have a unique golden hue as a result, negating the need for exterior paint and nicely matching the colour of the teak. Somluk’s team has also prepared a site in front of the pavilion where a statue of Lt-Commander Saman Gunan, the former Navy Seal who died during the rescue mission, will be erected on Thursday. Definitely worth seeing but area around the Tham Luang National Park is now busy with tourists - even the Chinese ! 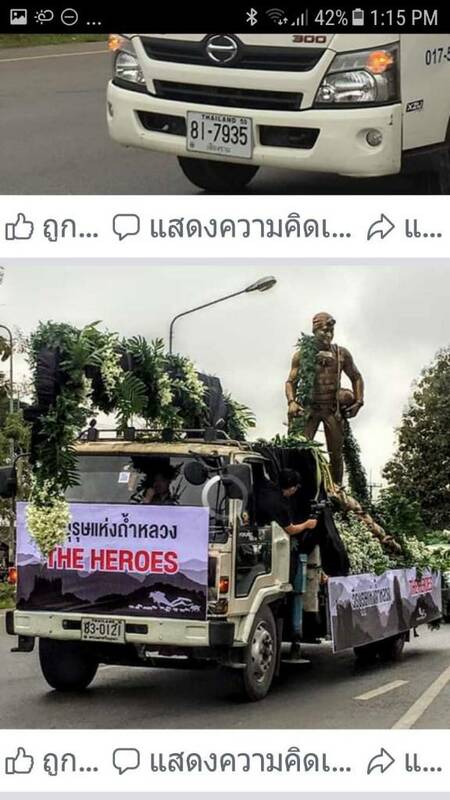 The traffic heading north came to a stand still in Huai Khrai yesterday as a huge statue of a man with oxy. bottle on his back and carrying flippers came along on a truck with music following and police with lights flashing everwhere. I was told it was an effigy of the drowned cave diver and it was on its way to the site. Thanks for that , that would explain it more , the Thai mob I was having coffee with legged it to the median strip , more looking from the bridge. Sent from my Forza sidecar using Cavity magnatron and vacuum tubes. Yes indeed and when you see those boys on their world tour me thinks their agent is getting quite rich by now.